If you’re still relying on keywords and traditional SEO strategies to increase traffic to your website, you could be losing ground in the competitive landscape of integrated search marketing. With over 800 million Facebook users, 100 million Google users, and 175 Twitter users, it’s time to branch out to reach your target market. Writing and sharing useful content will help you develop a following, build your reputation as an expert in your field, and improve your rank on search engine results pages. Whether you use Facebook, Google+, Twitter, LinkedIn, or a multitude of social media for delivering content, there are a few simple rules to follow. First Make sure your content is worth sharing. Your goal is for followers to share your content, to increase the number of followers, and to build your reputation as an expert. Therefore, you want to avoid sending stale or boring content. Second Make sure your content is targeted toward a specific audience. If you try to appeal to everyone, you will end up appealing to no one. Write for the audience you want to attract, and give them information they need and want. Third – Distribute regularly and respond to people’s comments. Use the functionality of social media to spread your wisdom to as many people as possible – often. When followers or followers of followers comment or ask a question, by all means, respond to them, engage with them. Following these simple rules will help you build your network for future business, as engaged followers will visit your website and ultimately engage your services. Sharing good content through social media has another important advantage – it can improve your website’s ranking on search engine results pages. When you add Google “authorship” code to your website and use Google + to distribute content, as people share your content, your online authority increase, which in-turn can have a positive effect on search rankings that bring new customers to your website. 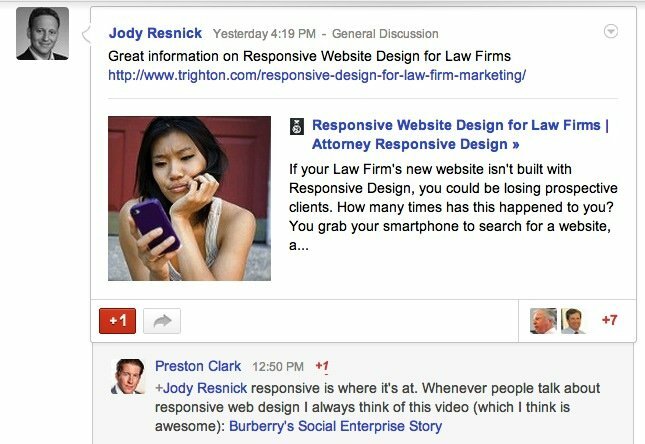 Below is a live example of Content I posted yesterday in Google + for Integrated Search Marketing. View the our ever enlightening video mentioned in Preston’s post above Responsive Design.